Paul Revere was born in 1735 in Boston, Massachusetts. His father, Appolloas Revoire, was a French Protestant who had come to America seeking to escape persecution. Not a great deal is known about Paul's mother Deborah Hitchbourne. Paul attended the equivalent of elementary school before learning his father's silversmith trade. It didn't take long before he became the most famous silversmith in the country. Paul made surgical instruments, tableware, frames for glasses, and even false teeth. Bored and hungry for some excitement, he spent 3 years fighting for the Massachusetts regiment during the French and Indian War. When Paul returned he once again opened up a silversmith shop. He was very politically active and quickly became friends with the biggest names in Boston politics including Samuel Adams, John Adams, John Hancock, and Dr. Joseph Warren. Soon Paul became a leader in the Boston Sons of Liberty. He would make a name for himself by dressing up as a Mohawk Indian and tossing tea into the Boston Harbor. During the year 1774, Paul Revere rode on a number of important missions for the Boston Committee of Safety. He rode to both Philadelphia, Pennsylvania, and Portsmouth, New Hampshire on secret missions. Then, on Sunday, April 16, 1775, Dr. Warren sent Paul Revere to warn John Hancock and Samuel Adams that General Gage had sent troops to arrest them. Revere rode to Lexington, Massachusetts to warn the 2 men that they must flee for their lives. At the same time, Paul Revere led a ring of Boston spies. 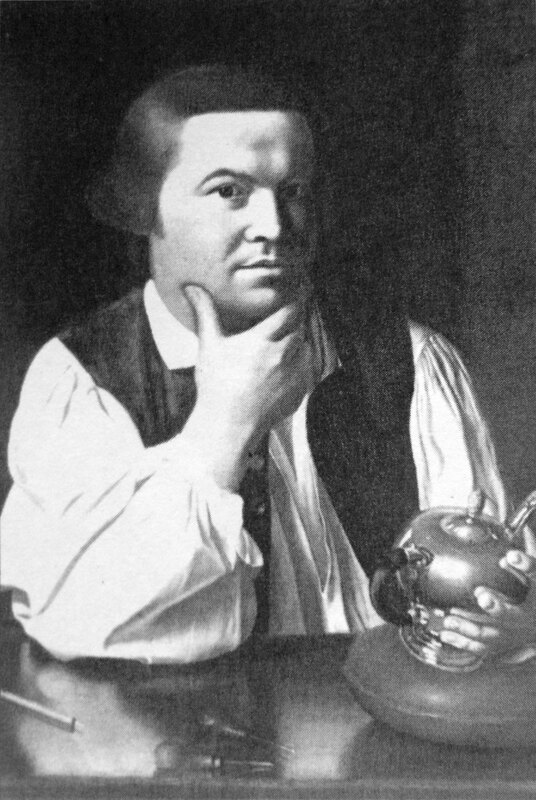 Paul Revere's spies had observed General Gage's men repairing some whaleboats. This led Revere to believe that the British were about to attack Concord where the American Patriots had kept a large cache of arms and ammunition. Paul arranged for a signal that would alert the countryside around Charleston of the movements of Gage's troops. He placed his friend, John Pulling, high in the steeple of the North Church. If Pulling saw the troops moving by land out of Boston then he was to show one lantern, but if he saw them board the whaleboats, they would know that Concord was being attacked and he would show two lanterns. On April 18, some time after nightfall, General Gage had his sergeants wake up the light infantry and grenadiers. After all 800 of his most elite troops were awake the British soldiers headed directly to the whaleboats. Pulling saw them getting into the boats and immediately opened the sides of 2 lanterns. Without hesitation, Revere and another courier for the Sons of Liberty named William Dawes took off towards Boston to warn the countryside that the British were crossing the bay and heading for Concord. Throughout the countryside they shouted over and over that, “The regulars are out!” Finally, Revere reached the house of Parson Jonas Clark where John Hancock and Sam Adams were in hiding protected by the militia. Shortly afterward Hancock and Adams fled for their lives to Philadelphia. Revere and Dawes were joined by Dr. Samuel Prescott, and the three continued riding through the night warning the people of Concord that they were being attacked. For a short time the British would capture Revere only to let him go. Finally, on April 19, 1775, Gage's men finally lifted themselves out of the whaleboats that had slowly taken them from Boston to Lechmere Point. The British were startled when they heard the church bells ringing and immediately they came under intense fire. The entire countryside knew they were there.